A 'glory' is a rare optical phenomenon that is mostly seen by pilots and mountain climbers looking down at mists or clouds. Forming a miniature circular rainbow, glories are seen when the Sun shines from behind and interacts with water droplets to refract light back to the observer. This picture is an even more rare example of a glory seen from space. 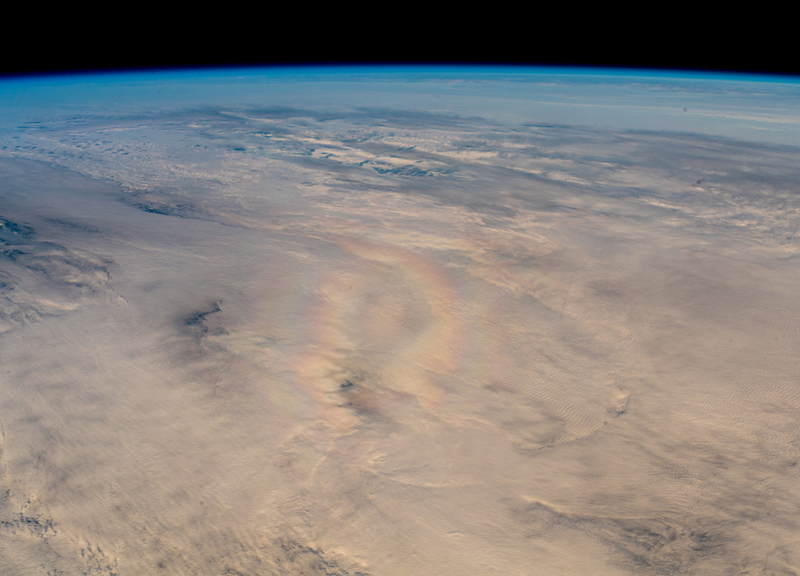 Snapped by ESA astronaut Alexander Gerst on 14 September 2018 during his Horizons mission, he commented: "Surprised to see a pilot's glory from the International Space Station, an optical phenomenon that is often visible from aircraft, or on volcanoes when looking down in a foggy crater, with Sun in the back. Our shadow is (theoretically) right in the middle of the rainbow, but we don't have a core shadow due to our altitude." To see a glory at the International Space Station's cruising altitude of 400 km is surprising as they require specific atmospheric conditions. Our atmosphere extends to 480 km above the surface of Earth but most of it stays within 16 km, making the boundaries of where "space" begins hardly a defined point. This observatory is not designed to investigate glories but space events such as sprites and blue jets are just as awe-inspiring to view from space. ESA astronaut Andreas Mogensen captured a sprite on camera from the International Space Station, proving the phenomenon can be observed from space - rare photos of the phenomena were also taken by pilots and researchers from mountaintops. Sometimes a simple photograph can spark scientific investigation or even full-blown scientific research. Alexander's pictures of aurora from his last mission in 2014 are adding extra information for researchers analysing these beautiful atmospheric displays of light. The International Space Station also hosted ESA's Solar facility that monitored the radiation emitted by the Sun across the electromagnetic spectrum. For almost a decade it tracked the Sun to measure our star's energy, delivering the most accurate data on the Sun's power that influences our climate on Earth but also how satellites operate in space. The phenomenon in this picture is related to atmospheric physics and so strictly speaking not space weather. This week, however ESA is highlighting space weather, from the science behind it and how we study it, to its effect on satellites in space and ESA's plans for the future.